The extraordinary world introduced in Paul Pope's "Battling Boy" is rife with monsters and short on heroes... but in this action-driven extension of the "Battling Boy" universe, we see it through a new pair of eyes: Aurora West, daughter of Arcopolis's last great hero, Haggard West. A prequel to "Battling Boy," "The Rise of Aurora West "follows the young hero as she seeks to uncover the mystery of her mother's death, and to find her place in a world overrun with supernatural monsters and all-too-human corruption. 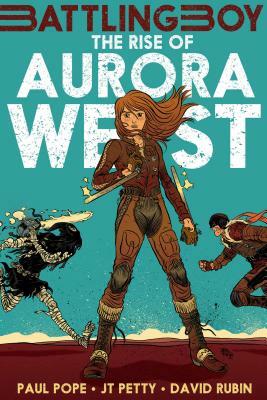 With a taut, fast-paced script from Paul Pope and JT Petty and gorgeous, kinetic art from David Rubin, "The Rise of Aurora West "(the first of two volumes) is a tour de force in comics storytelling. Paul Pope is the acclaimed author-illustrator of Batman: Year 100, Heavy Liquid, and 100%. Known for his frenetic, high-energy artwork and action-packed, genre-bending storytelling, Pope has won three Eisner Awards. He lives and works in New York City. His first graphic novel for kids, Battling Boy, was a #1 New York TimesBest-Seller.JT Petty is an American film director, author, and video game writer. His graphic novel, Bloody Chester, was also published by First Second. With Paul Pope, he wrote two Battling Boy prequels: The Rise of Aurora WestandFall of the House of West (illustrated by David Rubin). He currently resides in Brooklyn, New York. David Rubin is a Spanish cartoonist who has published several critically-acclaimed graphic novels including The Hero and Beowulf. He has also directed an animated feature film, Spirit of the Forest, and has been the subject of a documentary film himself. Rubin is the illustrator of two Battling Boy prequels: The Rise of Aurora West and Fall of the House of West (written by Paul Pope with JT Petty).